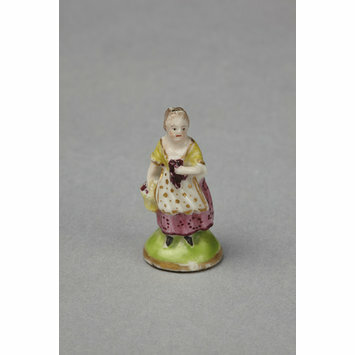 Figure in porcelain, painted with enamels and gilded, of a woman carrying a basket and a bunch of grapes, and she stands on a green mound. One of a set of thirteen figures made for mounting as seals 414:327/A to I, K to N-1885 (Sch. I 426A to I, K to N). This seal was given to Lady Charlotte Schreiber by Lady George Godon in 1874. 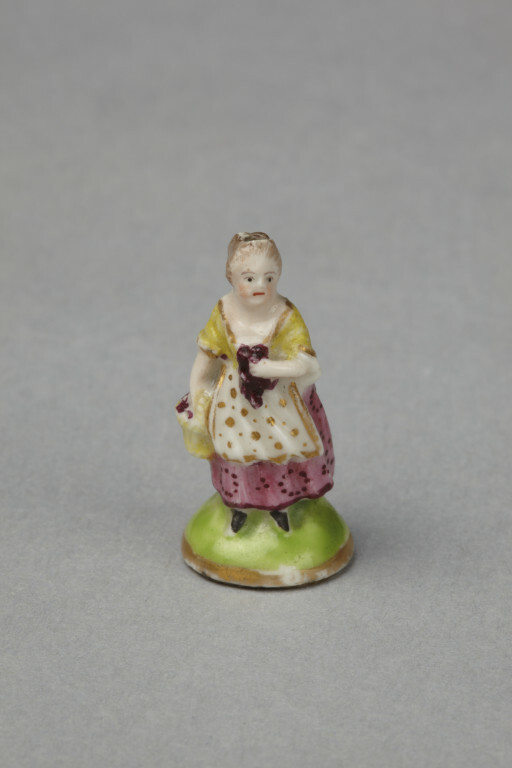 Figure in porcelain, painted with enamels and gilded, of a woman carrying a basket and a bunch of grapes, made by Derby Porcelain Factory, Derby, ca. 1775. Barrett, Franklin A. & Arthur L. Thorpe. Derby Porcelain, 1750-1848. London : Faber & Faber, 1971.